Beloved by millions of readers, Anne McCaffrey is one of science fiction's favorite authors. 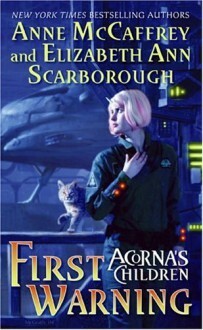 Writing with award-winning author Elizabeth Ann Scarborough, she has created the bestselling Acorna series focusing on the adventures of the brave unicorn girl.Now the exciting saga of the next generation begins.First WarningKhorii, daughter of the near-mythic Acorna and her lifemate, Aari, must contend with an overwhelming legacy to forge a path of her own through a universe filled with new adversaries and adventures.A simple journey home to visit her parents turns into a race against time when Khorii happens upon a derelict spacecraft drifting in space, its crew dead in their seats. But this gruesome discovery is only a dread harbinger—a deadly plague is spreading across the universe and not even the healing powers of the Linyaari can slow its horrific advance. Khorii, one of the few unaffected by the outbreak, must find the nefarious perpetrators and a cure before the disease consumes all in its path—including her beloved parents. I thought this series was done. Then I find out that she has children! Of course I had to pick up this book to see what is going on. We meet Khorii. Now there is another plague, but what is causing it? I did enjoy it because it is a Ms. McCaffrey story.